Please use the table of contents below or press CTRL+F / CMD+F and type in what you need help with to search the FAQ. Try to use just one or two relevant words to get the best results, as you may not phrase your question exactly how it has been phrased here. Additionally, you may find the Guide Index useful. Relevant guides will also be linked below with question answers. If you're having trouble understanding common abbreviations on CS please check out this guide. You can learn small tips and "hidden" tricks about CS here. Thank you to Shian and Trish the Stalker, previous FAQ and common suggestion compilers. Why can't I send trade messages/PMs? When users first register, they are added to a "Newly Registered Users" group with limited privileges. They are able to post in the forums, but their post will not be visible until a moderator approves it. They are able to send trades, but they may not send messages until this post is approved. This is to make sure the player is a real person and not a spambot. Once your first post has been approved, you will be able to post freely, as well as send trade messages and PMs. If your profile says you are a "Registered COPPA User," then your communication privileges (including trade messages and PMs) have been restricted due to the COPPA law. Please see below for more information on COPPA. Make sure cookies are enabled in your browser. They are required for you to stay logged in. If you are not sure how to do that for your specific browser, try searching it online or looking through this list to see if your browser has been discussed. Why are earlier posts missing from topics/threads? Your settings have most likely been changed so that not every post is displayed. Go to your display options here and make sure you have selected "All Topics" for the last two options, then click "submit." My inbox says 1 (or more) new messages and won't go away / I can't see the message? When your inbox fills up, new messages will be placed "on-hold." Delete some messages to make room and then click the "release all on-hold messages" link above the messages in your inbox. Why do I get the "Server is Broken" message when trying to post? If you are using any strange text symbols / non-CS smiley symbols the server may not recognize them. If that is the case, it will not be able to post them. Try removing the symbols and submitting the post again. Why does my post need to be approved by a moderator? / Where is my post? Some sites are blacklisted by CS for various reasons. If you make a post that includes a link or an image from one of these sites, it will need to go through manual approval by a moderator to make sure it follows forum rules. This happens more frequently to new users, but all users may experience it. It may take up to 24 hours for your post to be approved. The list of all blacklisted sites is not publicly available. Why won't my signature show up under my posts? First, go to this page and make sure "Attach my signature by default" is set to "Yes." If it is, click "Edit" on your post and make sure "Attach a signature" is checked in the options below the text box. If that is also done and your stamp collection is empty, you have likely set your stamp collection to show instead of your signature. Go to your profile and click the "[Click to display under your forum posts]" option above your signature. Why am I seeing random images? / Images on the site are not displaying properly. When you are having problems with images displaying incorrectly they have usually become corrupted in your device's cache/storage system. Clearing the cache for your browser (Google "How to clear cache for [browser name]" for instructions) will alleviate most of these issues. In some rare cases, Tinypic image URLs are replaced due to inactivity and you may see the wrong image. If you encounter an inappropriate image due to this please report the post/user profile where it is being shown. We reccomend using a different image host that does not delete/replace image URLs. Why can't I delete posts/threads? If no-one has posted after you, you can delete your own posts or threads by clicking the "x" in the upper-right corner of the post. If someone has posted after you, you can report your post and ask for a moderator to remove it. If you would like a thread locked, you can report it as well; you will not get in trouble for reporting a topic for this reason. Generally, moderators will not completely delete a thread. Why won't CS stop emailing me? If you are receiving emails upon getting a new private message, you can disable that here by changing the "Notify me on new private messages" option to "No." If you are getting emails about new posts on a thread, you can unsubscribe here. To post a new topic on the forum click "New Topic" under the forum title when viewing the forum you would like to post in. To post a reply to an existing topic click "Post Reply" under the topic title while viewing the thread or click "Quick Reply" while viewing the end of any page of the thread. To post images, you first need to find the direct link by right-clicking the image and selecting "Copy Image URL" or "Copy Image Location" for Google Chrome and Firefox. If you are using Internet Explorer, you need to right-click, select "Properties," and copy the given link. For Safari users, you need to right-click and select "Copy Image Address." To use an image from your computer or device you will first need to upload it to a site such as Imgur, an image hosting site. How do I make words clickable / link words / make a picture a link? How do I delete threads from the "My posts" page? "My posts" is exactly what the name suggests: it tracks every thread you have posted in, and threads cannot be deleted from this page. If you want to keep track of certain threads, it is much easier to use the bookmark feature. Just go to the thread you want to follow and scroll down to the bottom. You will see an option to bookmark it. You can get to your bookmarks by clicking the "View bookmarks" link at the top of the page, above the logout button. There is a guide about bookmarks here. How do I set up/change my trading rules? Click "Trades" at the top left of the page and then click "Trade Settings." Type your trade rules in the white box and then make sure you hit "Submit." On this page, you can also change your settings for receiving private messages when you get a new trade and whether users can offer on your items and C$. How do I show other users a trade / share a trade on the forum so everyone can see it? First, go to the trade page and view the trade. Scroll down to the very bottom of the trade. Directly above the 'Accept', 'Edit', and 'Cancel' buttons is the share trade link. Just copy that link and paste it into the message or post where you want to share the trade. What is bumping? / What does it mean when people post "bump" in the forum? "Bump" stands for "Bring Up My Post." When someone's post falls off the first page of the forum, people are not as likely to see it. By making a new post in the thread (usually "bump" or sometimes just "up") you can bring it back to the first page where it will be seen again. Bumping before the thread has left the first page of the forum is spam, however, so you should never bump if the thread is still visible on the forum's first page. The only exceptions to this rule are the threads in the Free Adoptions board. To bump a thread, you simply click the "Post Reply" button, type "bump," and then click "Submit." Also, when it has been 6 or more hours since the last post in the thread and you are the creator of the thread or made the most recent post, a "Bump Topic" button will appear at the bottom of the thread's page. By clicking this, you can bring the thread back to the first page without having to make a new post. This method can only be used once until a new post is made. How do I create/add a poll to my thread? When creating a new forum thread, there is an option that says "Poll creation" underneath the text box. Click this tab and several blank textbox options will appear. Fill in "Poll question" with the question you wish to ask, and put your answer options in the "poll options" text box. Separate each answer by pressing the "Enter" key. When you submit your thread, your poll will also be posted. Be aware that you cannot post polls on Oekaki drawings. If you would like to create a poll on an already-existing topic, simply edit the first post and follow the same instructions. How do I post fancy fonts or symbols? / How do I use BBCode to code posts/signatures? There are two types of fonts/symbols/special characters: images and regular text. Font images come from sites like dafont.com and 1001fonts.com and are usually samples of fonts for purchase. These fonts are commonly used in roleplay character forms and signatures but are considered spam if used in every post you make. Symbols or fonts that are regular text, such as "♥" or "нɛℓℓσ," can be used anywhere on the forum, but please note that special font characters make posts and thread titles very hard to read and therefore should be used sparingly. There is a simple BBCode guide here that explains the basics of using the coding options above your post field. The signature tutorial here includes a wide range of regular text fonts and symbols and explains how they can be used/coded. Can I be an staff member, artist, moderator, or general helper? Moderators and general helpers are hired through an application process. When the team needs more moderators or general helpers, there will be an announcement posted at the top of the forum with details on how to apply. There are no applications for artists, as artists are handpicked and invited by an admin, based on their art posted in the forum and Oekaki boards. Can I share a computer or internet connection with my friends/family/classmates? It is fine to play CS on the same computer or internet connection as other players. However, you should be aware that it is against the rules for an account to exist just to adopt things for another player. This means that if someone signed up just to adopt things for you, that is considered cheating even if there is a real person using the account. If you want to make sure you don't get accused of cheating, you should always keep your trades fair when you trade with friends and family. Don't allow someone to constantly give you free stuff if you never give them anything in return. Make sure that the pets you trade are fairly close in value to the pets you receive so it doesn't look like one of you is getting all the rares in return for "trash." Can I gift my friends and family? / Can I give all my pets to someone I know if I'm quitting? Small, occasional, or holiday gifts to your friends, family, or users who share your IP are okay. However, if you want to send a large gift or quit and give most/all of the contents of your account to someone, you need to get permission first. You can do so by sending a help request to our admin team including the giftee's username. Please wait until you receive a message approving the gift before going through with it. If you quit, you may not continue to adopt pets just to give them to someone else; this is considered cheating. COPPA stands for Children's Online Privacy Protection Act. COPPA players are US residents under 13 years of age. They cannot post in the forums or send messages, except in the Oekaki and Dress-up Challenge forums. COPPA players become Registered Users when they turn 13 or their parents send in a permission slip. You can read the guide here for more information. What is C$ / chicken dollars? C$ or chicken dollars are the CS site paid currency that can be used to purchase store pets and items here. You can see your C$ balance on the top bar next to the "Trades" link. If you want to add C$ to your account you can do so here using PayPal or a credit or debit card. C$ are tradeable and you can obtain C$ by trading with other players. You can also trade for the pets and items that other users purchased from the CS store. There is no "free" way to get C$ directly from the site, nor will one be added, but thanks to trading no store pets are items are "exclusive" to users who pay. What are the CS holidays & events, and when do they occur? Christmas/Advent Calendar: from December 1st to December 25th there is a daily gift available under the "tree." Except for the Christmas Day (25th) gift, each gift is only available for one day, so you need to login every day to adopt the gift. The Christmas Day gift remains up until December 31st. Easter and Halloween: Easter and Halloween are token hunt events. Each day, new gifts are released, and you must trade-in tokens found around the site to obtain each gift. There are also free gifts that do not require a trade-in to adopt. The Easter event takes place around the Easter holiday, so it is not on the same day(s) every year. The Halloween event usually starts about a week before the 31st of October. Summer Event: the summer event usually occurs in mid- to late-July, though there is no set start time. Every year since 2011, Avian and Totoro (the site mascots) have gone on vacation to a new location. This event usually combines token hunt elements with a story and is different every year. Minor Holidays: CS commonly celebrates "minor" holidays that do not involve tokens and are not huge events. Usually, there are just a few pets and/or items to adopt. The most commonly celebrated holidays are New Year's Day (January 1st), Valentine's Day (February 14th), Chinese New Year (varies), CS birthday (April 8th), and Hannukah (varies). Can I offsite trade? / Can I trade between CS and other sites? Trading between CS and other sites is allowed as long as the site you want to trade with does not ban offsite trading. You can view a list of sites that are known to ban offsite trades here, but the list is not guaranteed accurate. Please check with the site you want to trade with if you're unsure. Offsite trade requests belong in this forum. The only exception to this rule is trading between CS and Animal Jam (AJ) is banned. You can read more about those trades being banned here. How do I quit CS? / What happens to inactive accounts? If you no longer want to play CS you can simply stop logging in. It is not required to give away your pets or contact staff in order to quit. If you would like to have your account deactivated so you are no longer able to access it please contact staff through the help request system, but please know that this does not mean you may create a new account. If you want to return you must contact staff again to have your account reactivated. If an account is inactive (the user has not logged in for a long time) nothing will happen to it. Your account will always be there for you to return to. Why Chicken Smoothie? How did you come up with such a name? How do pets grow? / Can I make them grow faster? / Do I need to feed my pets? CS pets grow on their own, usually within 30 days of their adoption. You do not need to feed or play with them, and there is no way to make them grow faster. When are new pets released? New pets are released for adoption on the first of each month. Pets may also become available during events or on special days, so check the news on the homepage often! How many pets are there on CS? There is a user-created spreadsheet here that counts all the pets ever made. What is the Rares List? / What are list pets? "The" Rares List was a guide showing the pets that users had collectively decided were the most valuable, in order from greater to lesser value. Any pet on that list was considered a "list pet." This list was based on the rarity and demand of pets. You can still view this list here. However, the community decided to discontinue updating this guide and to move away from it for various reasons. The pets listed are still very valuable, but this guide being closed allows more freedom of trading for users. There are other guides being worked on to help users value pets, which can be viewed here: Rarity List, Rarity Trade Guide, and CS Pet Guide. None of these guides, including "The" Rares list are considered law and you do not necessarily need to use any of them in order to determine if trades are fair, though many users do. How do I find out the value of my pets? You can ask other users for help understanding the value of your pets here. We also have a guide to understanding Rarities here and a guide about trading fairness here. What is a paperclip trade? This type of trade is based on a popular news story where a man traded a paperclip for a slightly more valuable item, traded that item for another, and so on until he was able to trade for a house, all starting with his one paperclip. Paperclip trades refer to the idea that a user is taking a low value pet and slowly trading it up to a more valuable pet. Some users ask for overpay for the pet they are trading up, while others offer an add on to their side of the trade to get something more valuable. The goal is to eventually end up with a much more valuable pet than one started with. Some users do not like receiving these trades, because they feel users are asking for them to overpay. Why are some pets unknown rarity? / When will my pets get their rarity? Rarities may take up to three months to be updated after the pets are grown. Pets that are currently available for adoption will not have rarities added until they are discontinued and new pets are released. A pet that is still growing will never show its rarity. Do pet rarities change? / Why did my pet change rarity? Rarities are determined by comparing the number of pets on active user's accounts to the number of active accounts that exist. Over time as more users join older pets become less prevalent compared to the number of users, and their rarity may increase. It's also possible for rarities to decrease. This usually happens around the December holidays when pets are re-released into the game and many players return to the game from inactivity to adopt the advent calendar pets. This thread helps track rarity changes. What is PPS / EPPS / GUPPS? PPS stands for Peter Pan Syndrome and refers to a pet that will never grow to an adult stage. PPS does not affect your pet negatively in any way and cannot be reversed or removed. Some pets are considered "PPS" even if they do not have "PPS" on them because they are full-grown pets at the newborn or "teen" stage. "EPPS" is a term that means "early" or "extreme" PPS and is often used for PPS pets that stopped growing or never grew from their newborn/first stage, such as a puppy still under its blanket. GUPPS stands for "grown up" PPS. This usually refers to pets that are released during the advent calendar, where the artists of the original pet have chosen to create an adult version of a PPS pet they previously released. BBS stands for Benjamin Button Syndrome and is the opposite of PPS, so your pets are born as adults and will be old forever (as opposed to the non-BBS pets in the same litter that grew backwards into puppies). Store pets are pets that are available only in the CS Store to be purchased with C$ (chicken dollars). Store pets are available for purchase individually (usually for 20 C$ each) or as a set/bundle (usually for a savings of some C$). Occasionally there is an "exclusive" store pet that is only available when purchasing the pets as a set/bundle. They are often "special" looking pets with many edits, different features, or mythical themes. The schedule for store pet release is a new set every two months in February, April, June, August, October, and December. Store pet sets are occasionally late (not available on the first day of the stated months) but don't worry; they will be released. In the past, some store pets were available in different ways or for different prices, but what is stated here is the current method of store pet release. Store pets are never rereleased. Once they are no longer available in the store they can only be obtained by trading with other players. What are the pets' official names? CS pets do not have official names, but many have a common or widely accepted name that is used by most of the community. You can view the "Official" dog name guide here, which also links to most other pet name guides. You can also view the name guides on the CS Wiki here. Why is my pet appearing in the wrong place in my group? / Adoption date does not match group placement? Sometimes pets have to be recreated for various reasons. When this is done, the pet is assigned the next possible ID number. Though the adoption date is manually changed to the correct one, groups are sorted by ID number and the pet will appear according to its ID number rather than its date. It's perfectly normal and doesn't affect the pet or its value. Why doesn't my pet's date match the date it was released in the archive? If your pet has the date of 12-18 from any year or 12-24-2011 it may be a re-released pet (see below). Otherwise, your pet is likely an extended release pet or pet with an otherwise confusing adoption date. In the early days of CS pets were often available for more than one month. You can view a guide showing these pets here. Finally, store pets are usually available for two months, so that may cause their adoption date to not match the archive. What happens on December 18th? What is the "re-release"? What are "UR" pets? On December 18th every year, each user may adopt three pets out of a special box during the Advent Calendar/Christmas event. This box contains every pet ever released on the site, excluding store pets. Because old pets are being "re-released," it is often called the "re-release box." The box also contains at least one new, never-before-seen pet that is very rare. These pets, typically known as URs or "Unreleased" pets, are only released through the 18th of December re-release and are not available any other day of the year. Why is my pet still displaying an old dressup even after I saved a new one? Your cache is displaying the old image because your computer doesn't realize it has been changed. Press CTRL + F5 (on a PC) or CMD + R (on a Mac) while on the pet's page. This will perform a hard refresh of the page and display the updated dress-up. How do I put background items behind my pet? First, put the background item on your pet. Then, look at the bottom-right of your screen: there is a little tickbox marked "rearrange mode." Select it and then click the background. You should see two small arrows appear below the item. Click the one pointing down until the item moves behind your pet (or wherever you want it). Can I trade a pet with items on it? / Are items traded when a pet is traded? If your pet has items and a user is viewing it from your trading page or you offer it in a trade your trading partner will see the pet without any items on it. If one of you accepts a trade the items will be removed from the pet and returned to your inventory so they can be used on other pets. Trading a pet with items on it does not trade the items; if you want to add items to a trade oyu must do so separately. How do you put multiple pets in a dressup? You cannot put multiple pets in a dressup. If you see a dressup like this the user has either created/built another "pet" in the dressup using items (such as masks, wigs, shoes, clothing, etc.) or has used an image editing program to combine the transparent images of two pets. What is the Dress-up Challenge? You can view the Dress-up Challenge page here for information and to enter the current challenges. Please note that, while they are "challenges," there is currently no judging and no prizes awarded. You can check out an in-depth guide on the Dress-up Challenge and pet dress-ups in general here. What are the values of items? Is there an item "Rares List" thread? Item values are often more personal than pet values, as items do not have rarity tags (due to the way items are released, the rarity tags would not be helpful). We have a guide to the most valuable items here. You can ask about item values here. Items currently in the store are worth their C$ value, and you can compare that to pets here. Can I stop users from offering trade for my items or wishlist lock my items? You can stop users from offering on your items completely by going to Trades > Trade Settings > Don't allow players to make trade offers for my items. There is currently no way to officially lock only some items, though items that are on pets cannot be seen in the trade window, so you can lock your not-for-trade items by placing them on pets. There is no wishlist lock for items at this time. Roleplaying is when you control one or multiple characters that interact with other players' characters, based on a roleplay plot. For example, a roleplay might take place at a high school, and the players may control students, teachers, or other people who are part of the high school environment. Before you roleplay on CS you should familiarize yourself with our rules for human/humanoid roleplays and animal roleplays. You will find the roleplay forum here, where we have different sections for animal roleplays and human/humanoid roleplays. They are further divided into realistic, fantasy, and fandom-based categories, as well as separate sections for advanced (longer, more detailed) roleplays in each main category and 1x1 (private) roleplays. There is also a forum for roleplay storage and discussion. If you want to roleplay with a group, you should browse the boards or this thread to find a roleplay to join. If you are searching for a private roleplay, you can post an advertisement or respond to advertisements posted in this thread. You should set up private roleplays in PM before posting the roleplay in the 1x1 board. Once you find a roleplay you want to join that is open to new members, you need a character to roleplay with. You can either create a new character or use one you have already created. A lot of users offer a pre-made character form that needs to be filled out. Be aware that some users may want you to post your form on a separate discussion thread, which is often linked in the first post. Make sure you read all the rules of a group roleplay before joining it. In most cases, the creator of the roleplay needs to accept your form first. Once you are accepted, you are free to join in and write/interact with other players' characters. Roleplaying is based on the interaction between the different characters who are solving a problem, experiencing a tragedy, or finding romance. So, you write what your character does, what they think about, how they feel, and how they experience their surroundings and the current situation. You should only control your own character, not one that belongs to a different player. Which images are okay to use for my character? CS is an art site, and we take copyright infringement / art theft very seriously. You cannot use artwork to represent your character unless you have purchased that artwork for your own use, you have asked for and received permission from the artist to use the artwork, or the artwork is official art from a game/movie/show (not fanart). If you want to use images of real people, a good option is to choose a celebrity or model face claim and use images of that person to represent your character. If you want to use images of real animals, you can use images you own or that are licensed for free use. You should always credit the artist/photographer/model of the image you are using and show permission to use the image if you needed to ask for it. You can view an in-depth guide to finding and properly using images for roleplays here. What is Oekaki? How do I use it? 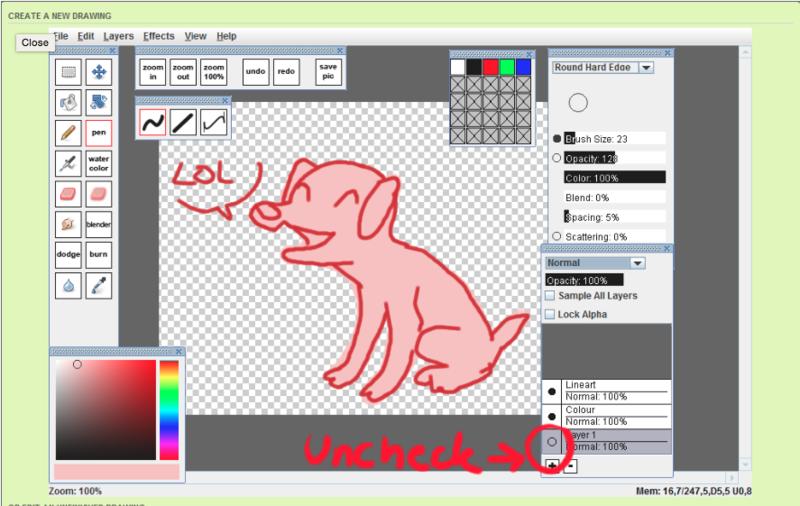 Oekaki is a browser-based drawing application. The Oekaki boards can be viewed here, and each board has been given a description to help you decide where your drawing fits best. Once you choose a board, you can start drawing by clicking "New Drawing" at the top of the board or by selecting a drawing you would like to edit in the Editable boards and clicking "Color Me In." Please check the guide here for information on the use of the different Oekaki tools and features. The Oekaki and/or Java won't work! What should I do? Make sure you have ChibiPaint set to V.2 here. Make sure you have downloaded Java here. Java has increased its security settings once again and now requires CS to be white-listed. This can be done by accessing your Java Control Panel and adding CS to the Java Exception list. Use the instructions given here. Check which browser you are using. Google Chrome no longer supports Java, so you will have to use a different browser. Firefox works best. Make sure Java is enabled on both your browser (follow the instructions here) and your device. If you are still experiencing problems after you have done all of this, please check the Oekaki/Java Problems and Solutions guide here or send a help ticket detailing your issue and how you have already tried to fix it. Can I upload a drawing / my own images to Oekaki? There is no way to upload existing art or drawings to the Oekaki canvas. All drawing on the Oekaki must be done within the program. This is due to the limitations of the program but also helps avoid art theft. How do I get pen pressure in Oekaki? If you're using Windows you can install the official JTablet plugin here. If you're using a recent version of Mac OS X Nick has created a special version of JTablet here. You do not need to uninstall the non-working version of JTablet if you already have it! How do I rotate my canvas / make my canvas vertical? First, make sure you have ChibiPaint set to V.2 here. Then, select the rotate tool and drag your canvas until it is vertical. How do I make a background image transparent for an Oekaki drawing? First, make sure that you do not draw anything on the white layer that's at the bottom of your drawing, then you have to hide it: the checkered background has to be showing. Finish your drawing, save it, and submit. Once your drawing is posted, copy the direct link to the image and take a look at it. If you post this code with [img] tags around it, it will show up correctly with a transparent background. How do I resize an Oekaki drawing? Find the "large" in the link and change it to medium, small, or gallery sizes. Many suggestions have threads in this board and have neither been affirmed nor declined by the admins or general user opinion. Please show your support for a suggestion by posting in the existing thread. Do not create a new thread to suggest an idea that already has a thread. If you do not see your suggestions listed here, please use the search function to check if a thread already exists. If you would like a unique suggestion added to this list feel free to PM me! Make a CS phone app: CS has a working mobile version, and an app has been deemed unnecessary. Add a chat box/chat room: CS once had a chatroom, and even as a much smaller site, it was impossible to moderate the chat. Change the pound system to give out more rares: the pound is not a rares farm and will continue to have a fair distribution of different pet rarities. Re-release store pets: Store pets are sold with the knowledge that they will be retired and never made available again. It would not be fair to re-release them. Add an item to grow PPS pets / freeze pets in their second stage: it is the artist's decision whether a pet will stay PPS or continue to grow. Add a "spoiler" BBCode option: this would lead to spam and hidden posting of inappropriate content. Make CS pets breedable: please read this. Make C$ free: CS is supported by C$ sales. You can trade other users for the C$ if you cannot or do not wish to buy any, but it will never be given away for free. Search for users who own certain pet or have certain pet for trade: this would lead to users being spammed with trades and greatly strain the server. Create "post styles" where you can save font colors/coding and use them in every post: this encourages users to make their posts hard to read. Search for PPS pets in achive: believed to be ineffective because the pets would appear with their entire litter; not all "PPS" pets have the tag. Add item rarities: items are not released the same way as pets, so rarities would only confuse trading. Auto-cancel item trades: this is not possible because items do not have unique ID numbers like pets. Add description boxes to pet pages: this would be very hard to moderate. You can post stories and info about your pets in the forums. It is not safe to use the same password for everything. This is especially important if you've been using the same password for years. A good password should be hard for your friends and enemies to guess. Don't include any parts of your username, email address or real-world name, and don't include information that your friends could easily find out like your birth year. To change your CS password, go to the "My Account" link at the top of the page, then the "Username & Password" tab. Or you can just click here to change your password instead. You can contact staff privately if you need help or want to report something to us! Hover over 'Help' underneath the header image and then click on 'Get help from staff', or click on 'Help' and then click on 'Contact us'. Both links will lead you to a form you can fill out and submit to us. The CS server runs on the GMT +0 timezone. New content usually gets released at midnight GMT, this is what users generally refer to as rollover. Every time you adopt a horse or pony, you have a small chance to receive a very valuable zebra instead! If you've found a zebra and would like to trade it, make sure you ask staff or knowledgeable members for advice so you can get a fair offer for it. You might be surprised by how much it is worth! Pets turn a day older at the time you adopted them! If you are ever unsure if your pets already aged or not, check the age on your pet's profile page. They are 0 days old when you adopt them, so when you adopt on the 1st of a month, they will be 1 day old on the 2nd, precisely 24 hours after the moment you adopted! We have a team page! It is linked at the bottom right of pages on our site and you can find out a little more about our current and past staff members there! You can view more than 20 pets at once! When you view one of your pet groups, simply add &pageSize=100 (or any other number) at the end of the page URL and press enter. Keep in mind, the more pets you choose to display the longer the page takes to load! If you have trouble identifying someone else's dressed pet, you can view it without items! Open up the dressed pet image in its own window and add &noitems=1 right in front of .jpg in the image URL. Press enter to reload the image with no items! Try it out! If you want to move many pets from one group to another but not all, you can easily select multiple pets without clicking each one individually! Tick one of the pets you want to select and then hold down shift while ticking another pet further in the group. All pets between those two pets will be selected automatically! Rarity of a particular pet is determined by how many of those pets are owned by active accounts! You might see your uncommon pet suddenly change to rare or vice versa, and this is normal. Changes happen all the time as the pets get traded and players come and go. Some of our early litters were available for adoption for longer than just a month! If you have trouble finding such a pet in the archive, try going back further. The pets will appear in the month they were first released, even if the one you have was adopted months later. Oekakis are saved as jpg files but you can also make them display as png files! Right click on your Oekaki to get the image URL. Part of the URL will contain &format=auto. Simply replace that part with &format=png. Now you can also show off your characters or adoptables with a transparent background if you hid the background layer in the Oekaki. You can enter hex codes in our Oekaki to use specific colors of characters! Just click the bar that shows the color you selected in the color picker and a little pop up window will show up where you can enter the hex code. It is possible to display your Oekaki images in different sizes if you post them in the forums or on other websites! Part of the image URL will contain &size=large and you can replace the 'large' in it with medium, small or gallery. When your PM inbox fills up, you will still be notified of new messages but they will be held back until you make some room! When there's not enough space for new PMs there will be a link at the top of your inbox saying 'Release on-hold messages'. Delete some PMs from your inbox to make room, then click the link so you can receive your waiting messages. You can save a draft of your post if you're not ready to post it yet, but don't want to lose your progress! Instead of hitting 'Submit', hit 'Save draft' next to it. You can manage your drafts by going to your account settings and clicking on 'Manage drafts' in the side bar of your account setting overview. You can bring back the post through that setup, or you can create a new thread and hit 'Load draft' which should appear next to the preview and posting options. You can save a draft of your PM if you're not ready to post it yet, but don't want to lose your progress! Instead of hitting 'Submit', hit 'Save draft' next to it. You can manage your drafts by clicking on 'Manage PM drafts' in the side bar of your PM inbox. You can bring back the PM through that setup, or you can create a new PM and hit 'Load draft' which should be appearing next to the preview and sending options. We have a bookmark feature that lets you track threads you like or remove them from the list once you're bored of them! At the bottom of each thread, you will find a link to bookmark the thread you are viewing; and you will find a link to view and manage your bookmarks above the logout button!